There are many more excellent remedies available for other first aid purposes, including: burns, scalds, dislocations, collapse, sunburn, heat exhaustion, etc. This is a composite Bach Flower preparation combining five of the Bach Flower Remedies: Cherry Plum, Clematis, Impatiens, Rock Rose and Star of Bethlehem. It is excellent for all kinds of shock and trauma, terror, anger, feelings of desperation and “stage fright”. It is not a homeopathic medicine as such, and like all the flower essence remedies can be combined with homeopathic treatment. It is available as a liquid in dropper bottles and as a cream, both available from most health food stores. I recommend having a few of the below in stock, mainly as creams or ointments. Taking the correct remedy by mouth is even more effective - you can do both together. Hypericum & Calendula cream (Helios): for minor cuts, grazes, bites and stings. The tincture is excellent diluted for cleaning wounds (see my information sheet on Tetanus Prevention). Burn cream (Nelsons; contains Calendula officinalis, Urtica urens, Echinacea angustifolia & Hypericum): excellent for minor burns and scalds. Rhus tox & Ruta cream (Helios; contains Rhus tox, Ruta and Ginger): excellent for sprains and strains of muscles, tendons and ligaments. Urtical cream (Helios; contains Urtica urens, Calendula, Chamomile and Lavender): excellent for any rashes where there is itching and/or burning. Chilblain cream (Nelsons; contains Tamus communis): for chilblains. Both Helios and Ainsworths have a variety of compact well designed kits that are perfect for the home, the car, the travel bag, college, etc. I strongly believe that everyone, including children, should be proficient in basic first aid. Most of us will, sooner or later, be in a position where we can offer help to someone in need of first aid. 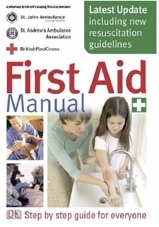 We may also be unfortunate enough to find ourselves requiring first aid - how can we expect others to have these basic skills when we haven’t taken the trouble to learn them ourselves?